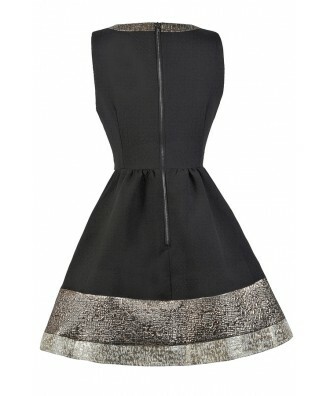 This little black dress is amped up with gold metallic fabric at the neckline and skirt. The Gold Foil Black A-Line Party Dress is fully lined and made of a heavy fabric that makes it perfect for Fall and Winter. It has a rounded neckline, wide shoulder straps, an empire waist, and an A-line skirt. The best part of this dress has to be the metallic gold fabric that trims the neckline and hem of the skirt, adding a touch of shine to this look. An exposed back zipper completes this dress. 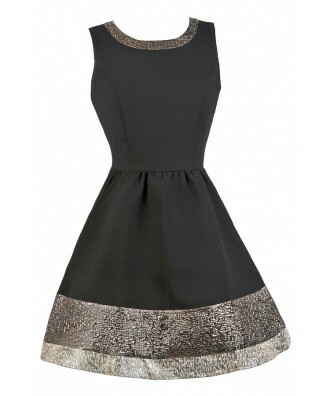 The Gold Foil Black A-Line Party Dress is the perfect little black dress with a twist! Pair it with black or gold metallic pumps or heels and a clutch for a chic and polished look. Details: Fully lined. Exposed back zipper. 100% polyester. Hand wash in cold water. Do not bleach. Wash separately. Small measurements: Length from top of shoulder to hemline: 33". Bust: 34". 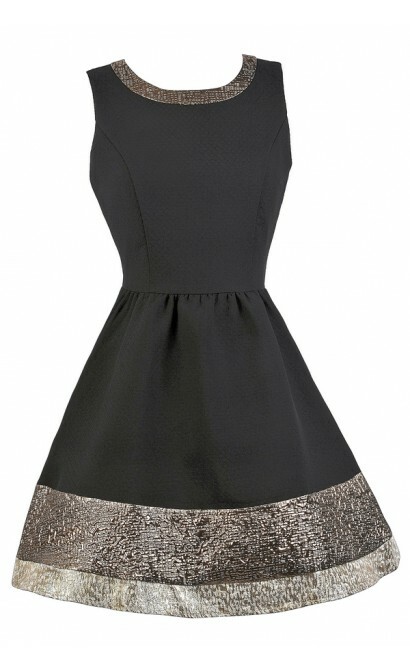 You have added Gold Foil Black A-Line Party Dress into Wishlist. 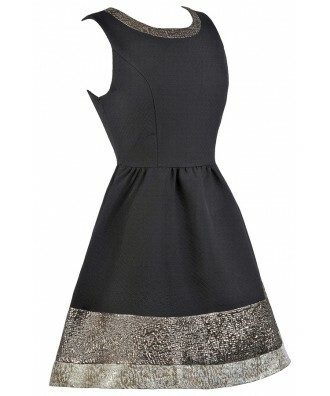 You have added Gold Foil Black A-Line Party Dress for Stock Notification. You have set Gold Foil Black A-Line Party Dress as a loved product. You have removed Gold Foil Black A-Line Party Dress as a loved product.